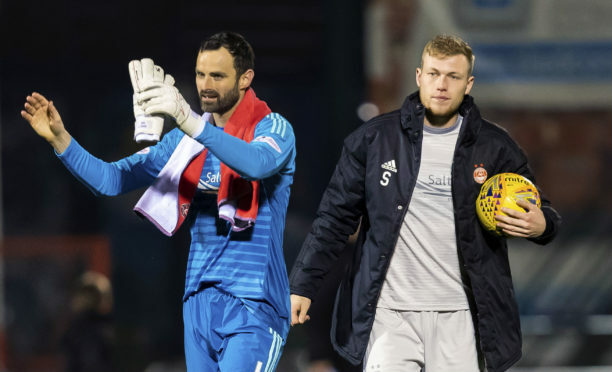 Aberdeen goalkeeper Joe Lewis and Sam Cosgrove after the Kilmarnock draw. The Dons slipped five points behind the Hoops after missing out on the chance to move second on Saturday when they were held to a goalless draw by Kilmarnock at Pittodrie but Lewis, pictured, says it is too early to be concerned. He said: “All the teams will drop points. It’s down to the teams at the top of the league to keep winning games. We can’t control what Celtic do unless we are playing them. We are just focusing on winning games and trying to get to the split. The Dons keeper had one of the easiest afternoons of his career as Killie failed to muster an attempt at goal but there was no hiding his frustration at not taking three points. Lewis said: “I organised the lads in front of me really well and managed to stop them getting to us. From my point of view it was a quiet game. They came here to try to stop us and counter-attack but we did really well defensively. Lewis knows Saturday’s game will be good preparation for tomorrow’s Scottish Cup replay at Stenhousemuir.